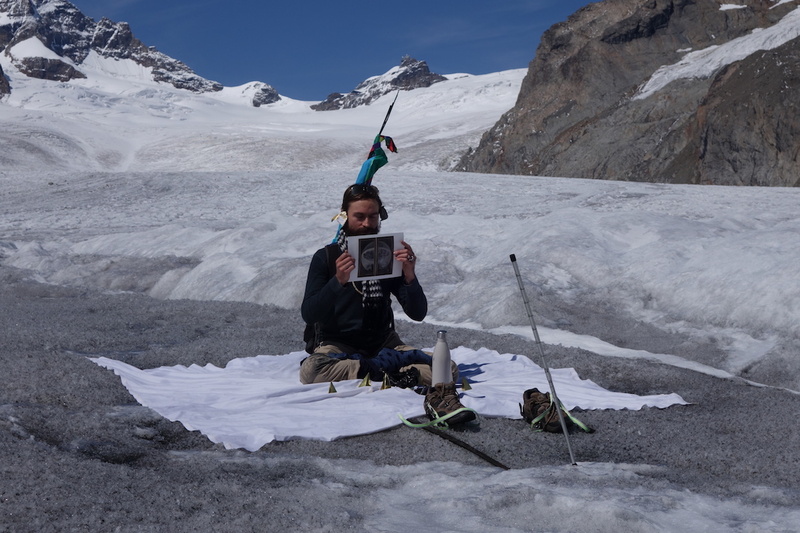 I peformed Explaining a Bosch Triptych to a Dying Glacier five times while in residency at Konkordiaplatz, with Matza Aletsch, on the largest glaciers of the Swiss Alps. It was a meditation and an effort to communicate with the glaciers, to apologize for human recklessness, to ask for forgiveness, to express gratitude and love to them for supplying water to Europe, and to send out a wish for their survival and the survival of all living beings on the planet through this time of extreme change. The work references Joseph Beuy’s peformance, Explaining Pictures to a Dead Hare. I explain the Heironmous Bosch Triptych, Garden of Earthly Delights, to the quickly melting Aletsch Glacier, as an allegory for the psychological disjunction of humanity from the world and the rampant environmental destruction that humans have propagated since industrialization. With gold flakes and honey from the Rocky Mountains on my face, I connected with the radiance of the sun and the bees around the world, that are also suffering from the effects of industrialization (chemical toxins and climate change). After each performance, I felt a sense of tranquility. Some of the spectators, my fellow artists on the Matza Aletsch expedition, also said they felt this peace.